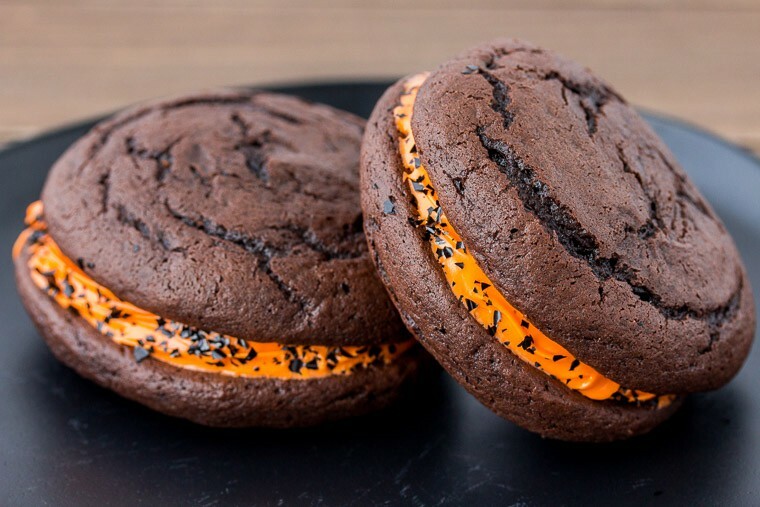 Halloween Whoopie Pies are a fun, delicious treat for all your little ghosts and goblins! Decorate them in classic black and orange colors or make them a bit spookier by turning them into spiders! When my now 11-year-old was in Kindergarten, he was allowed to bring in a treat for his birthday. I wasn’t cooking and baking as much back then as I was a single mom and worked full-time outside of the home. Naturally, I went online to find something yummy to make. We decided on a whoopie pie recipe that used cake mix. In between the whoopie pies, I used cake icing. They ended up reminding me of how some people break the bottom off of their cupcakes and stick it on top so the icing is sandwiched in between. Regardless, those whoopie pies were amazingly good. I’m not just saying that because I’m about to tell you how to make them. Even his teacher, who retired after his class, said that they were the best birthday treat that anyone has ever brought in and asked me for the recipe. I gave her the recipe and then somehow lost my own copy. After searching Google for cake mix whoopie pies, I think the recipe that I used before may have come from Betty Crocker or a recipe that was based off of Betty’s. I remembered that there was pudding mix in with the cake mix. My son had been begging me to make them again. I love that 6 years later, he still remembers these little things. 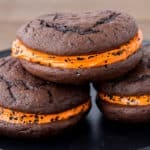 So, we made these Halloween Whoopie Pies, using Betty Crocker’s Cake Whoopie Pies recipe for the cookies. The cake mix we use is Devil’s Food, of course. If this wasn’t the exact same recipe from Kindergarten, then it was super close! These little cookie cakes are perfection! In between the cookies, I used vanilla cake icing that I colored orange with food coloring gel and black edible sparkles (they can be hard to find, but black sprinkles work great too). You can also decorate the cookies using Halloween stencils and powdered sugar or make spiders using black rope licorice for the legs and candy eyes! I’ll show you how I decorate them in the directions below! There isn’t any real prep work to be done for this recipe. Just have your ingredients all out and ready to go. 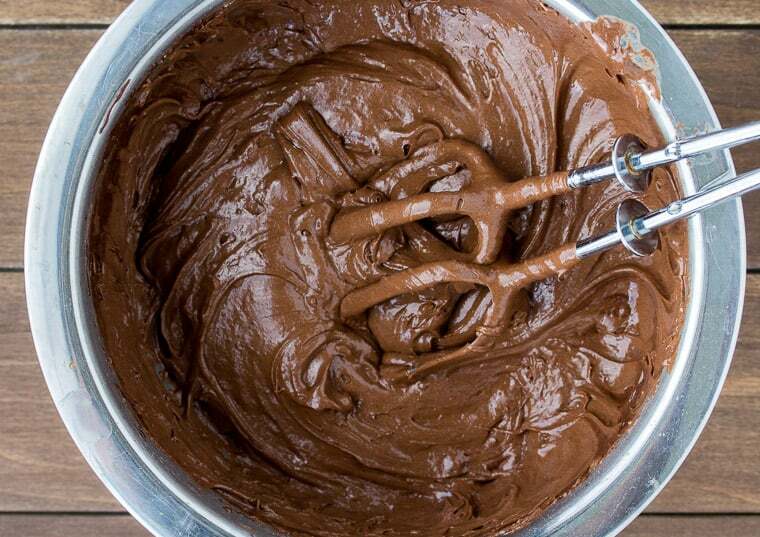 Combine the devil’s food cake mix, water, vegetable oil, eggs, and pudding mix in a large mixer bowl and beat on medium until everything is well blended. The batter will be thick! For larger whoopie pies, add 18 evenly sized (as best you can!) 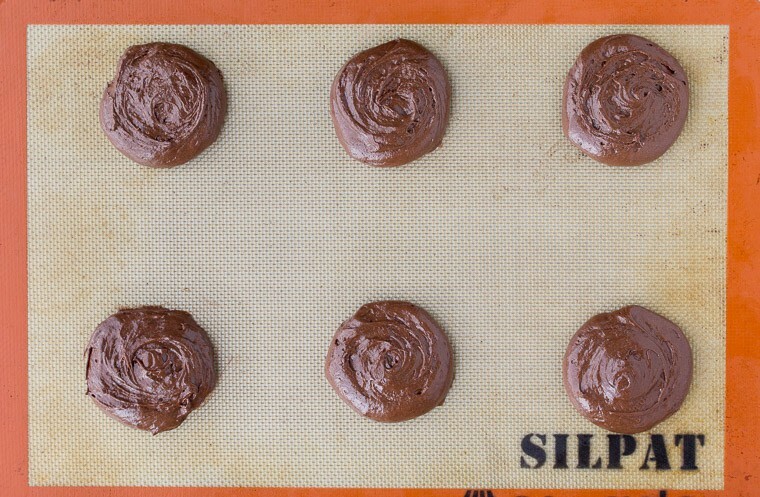 scoops of the batter on to Silpat-lined baking sheets in a round shape. You can also pipe the circles using a large piping tip and pastry bag for more even results. NOTE: For smaller whoopie pies, make 36 smaller circles with the batter. Bake for 7-10 minutes, depending on the size of the pies. When done the cookies will be spongy and cooked through. Meanwhile add the vanilla icing to a small bowl. Mix in orange food coloring gel until well blended and you reach the desired color. Pipe (or spread) the icing onto the flat side of one whoopie pie cake and top with a second cake. 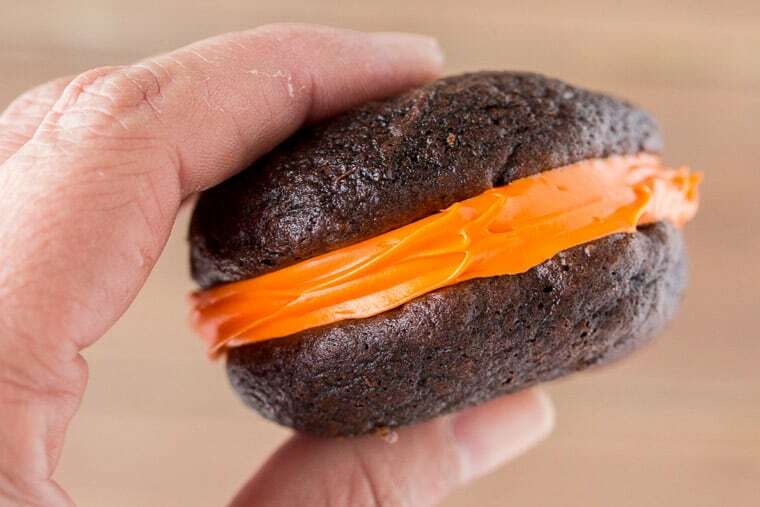 A quick, yet festive, way to decorate these Halloween Whoopie Pies is to use black sprinkles or edible cake sparkles, if you can find them! 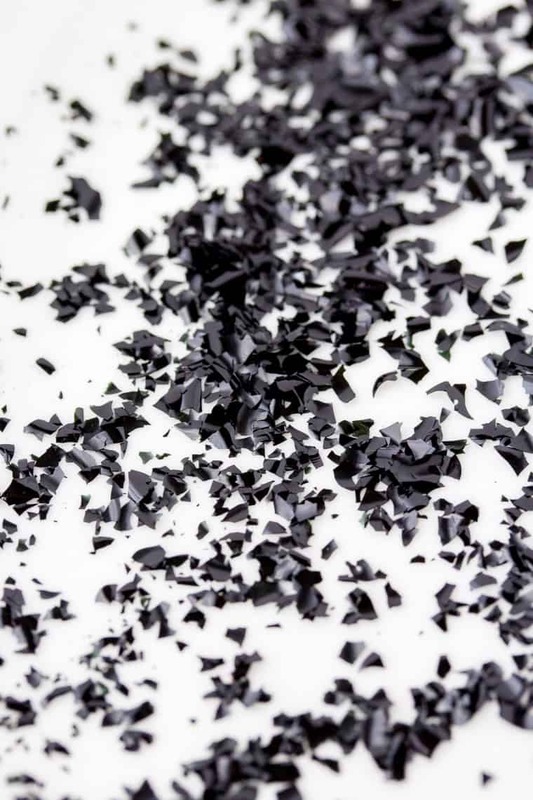 Simply sprinkle on the black sprinkles once the whoopie pies are assembled. 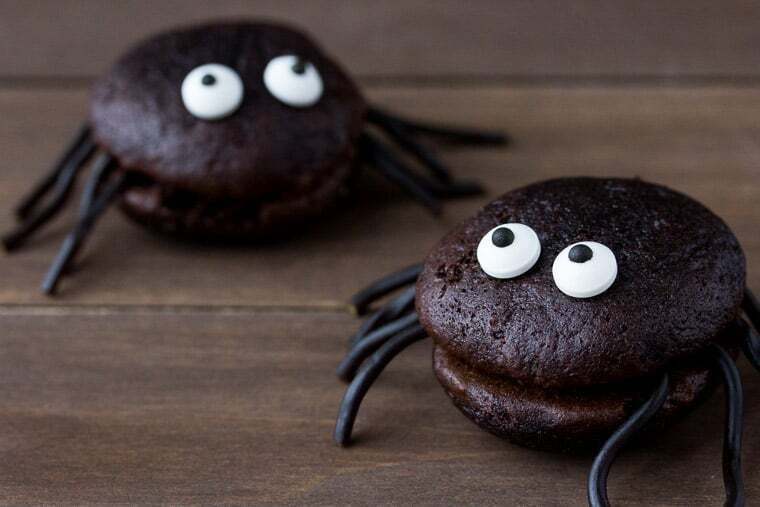 To make Halloween Whoopie Pie Spiders, use 4 pieces of black licorice for the legs. Lay the licorice onto the icing before topping with the second whoopie pie. Use a little bite of extra cake icing to stick candy eyes onto the tops of the pies. You may want to color your cake icing black (or use chocolate flavor!) for this version. Either purchase small halloween-themed stencils or print/cut out the desired designs you wish to stencil on. With stencils, make sure the stencil completely covers the whoopie pie to ensure you don’t get powdered sugar where you don’t want it. Use powdered sugar and a sifter to lightly cover the stencil. Carefully remove the stencil to see your design! 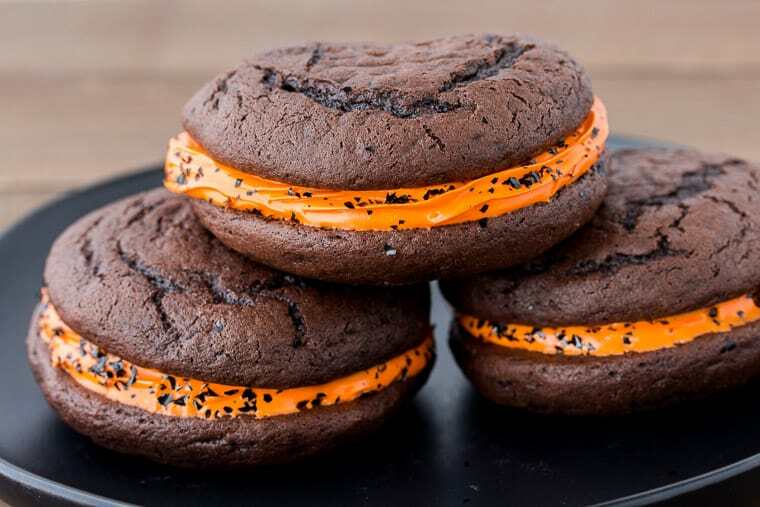 Love this Halloween Whoopie Pies recipe? Follow us on Pinterest, Instagram, and Facebook for more! Combine the devil's food cake mix, water, vegetable oil, eggs, and pudding mix in a large mixer bowl and beat on medium until well blended. 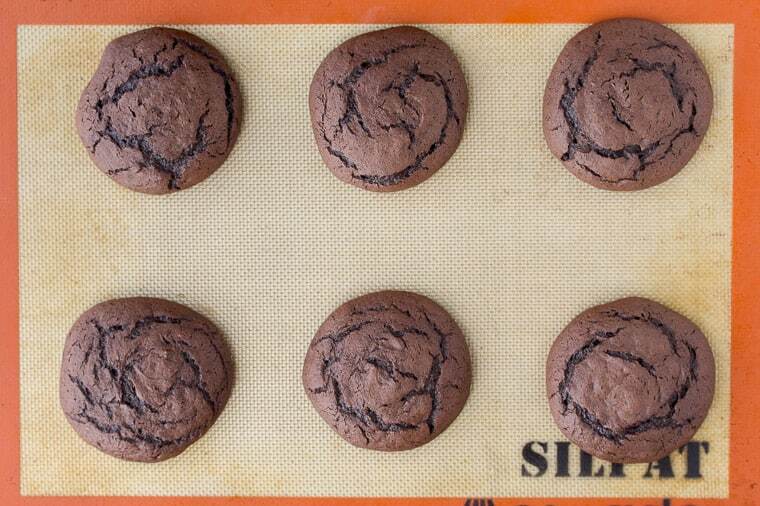 For larger whoopie pies, add 18 evenly sized scoop fulls of the batter to silpat-lined baking sheets in a round shape. You can also pipe the circles using a large piping tip for more even results. For smaller whoopie pies, make 36 batter circles. Bake 7-10 minutes, depending on the size of the pies. Let fully cool before decorating. 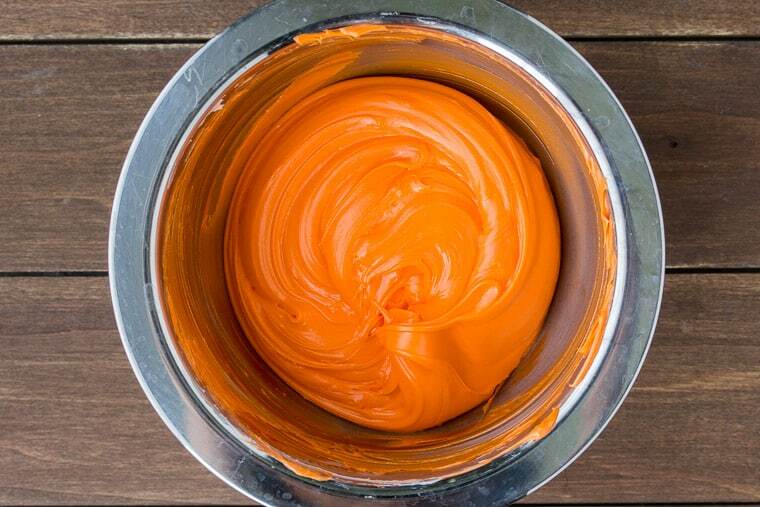 Color the vanilla icing by mixing it with orange food coloring gel until well blended. Pipe the icing onto one whoppie pie cake and top with a second cake. Sprinkle on the black sprinkles. 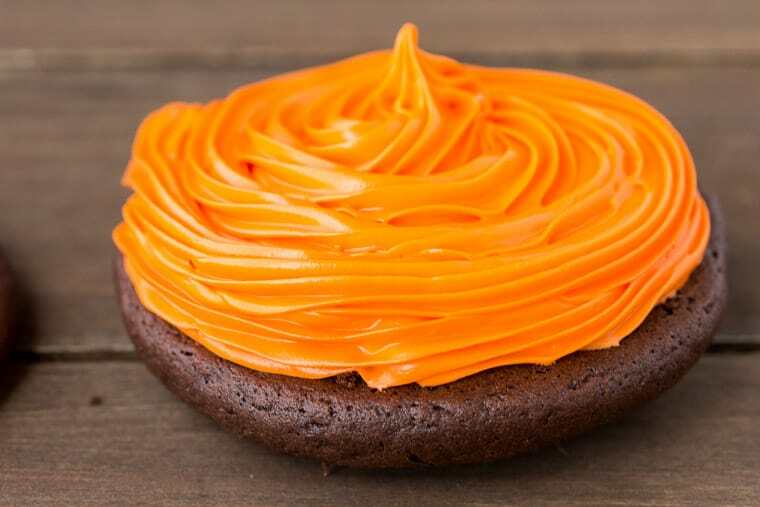 Alternatively, you can use halloween stencils and powdered sugar to put designs on the tops of the whoopie pies. See notes. Another option is to add 8 licorice legs and candy eyes to make whoopie pie spiders! See notes. Either purchase small halloween-themed stencils or print/cut out the desired designs you wish to stencil on. Make sure the stencil completely covers the whoopie pie to ensure you don’t get powdered sugar where you don’t want it. Use powdered sugar and a sifter to lightly cover the stencil. Carefully remove the stencil to see your design! 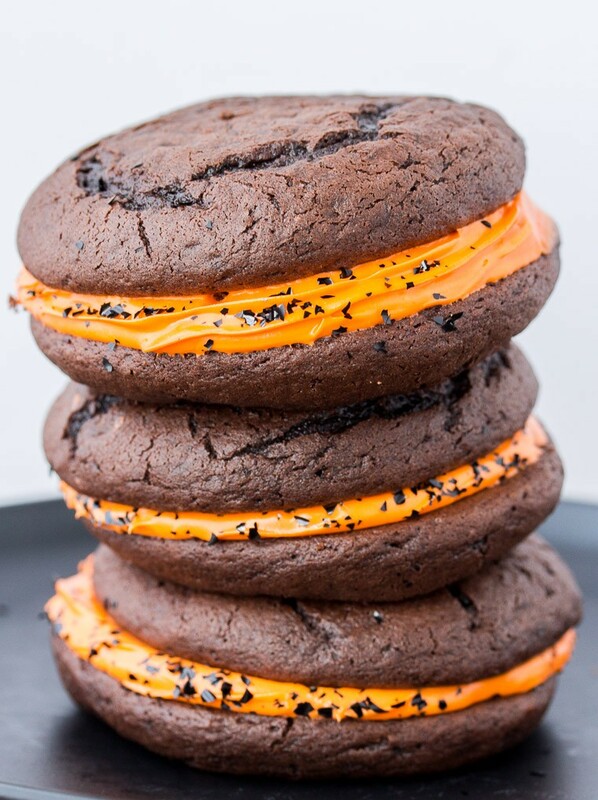 To make Halloween Whoopie Pie Spiders, use 8 pieces of black licorice for the legs. Lay the licorice onto the icing before topping with the second whoopie pie. Use a little bite of extra cake icing to stick candy eyes onto the tops of the pies. You may want to color your cake icing black (or use chocolate flavor!) for this version. What temperature are you supposed to preheat your oven? I guessed 350F, but I can’t find temperature in the recipe. So sorry! Thanks for letting me know and yes 350 – I just edited the recipe card too. 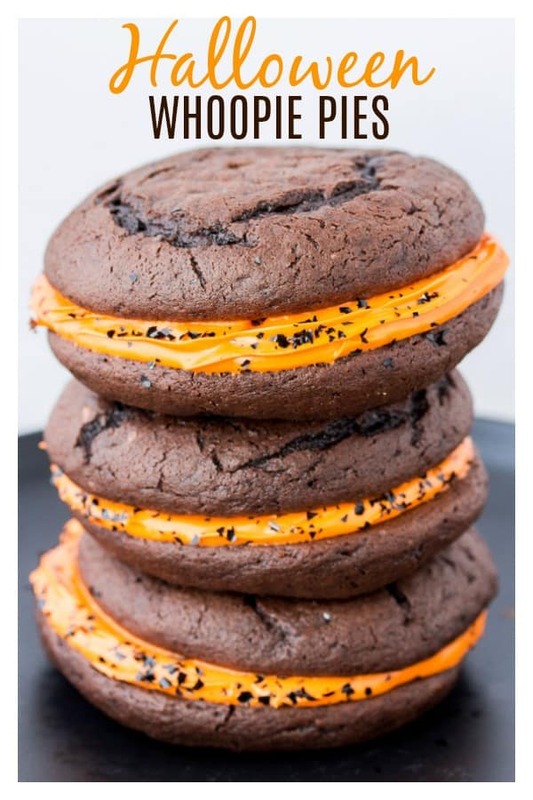 I love Halloween, and I love whoopie pies so this is PERFECT! They look delicious! It’s been years since we made Whoopie pies, and yes, they are so so yummy. I love the way you decorated them for Halloween, too! What an amazing halloween idea! Can’t wait to give these a go! These are so cute and perfect for Halloween! I love the bright orange colour of the icing filling. I love these! So cute and perfect for Halloween! these look AMAZING!!!! love the colours and they look so decadent and delicious!